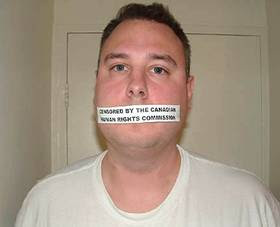 The FreedomSite Blog: CHRC: Gag Lemire Now - Who cares whether or not Section 13 is constitutional? CHRC: Gag Lemire Now - Who cares whether or not Section 13 is constitutional? CHRC: Gag Lemire Now – Who cares whether or not Section 13 is constitutional? The fanatical and discredited Canadian Human Rights Commission is demanding that a lifetime speech ban be placed on internet webmaster Marc Lemire – and they are refusing to even allow the Federal Court of Appeals to make a ruling on the Constitutionality of Canada’s shameful internet censorship legislation – Section 13 of the Canadian Human Rights Act. The utter arrogance and obsession with censorship that infests all those who staff the Canadian Human Rights Commission is shocking to many Canadians. Is it any wonder that its senior investigators consider freedom of speech to be "an American concept?" But even in the face of their censorship empire (Section 13) crumbling around them, the censors insist on remaining aboard a sinking ship." As is typical for the elitist CHRC censors, they simply brushed aside all legitimate criticism. They responded by once again screwing Canadian taxpayers by hiring the super expensive public relations firm Hill & Knowlton for a whopping $170,000! This was a futile and an expensive attempt to reverse the tide of public opinion that was turning against them. But a leopard never changes its spots as the CHRC continued with its devious ways, including spying and trying to entrap Marc Lemire. Knowing that their days of harassing and abusing Internet writers, bloggers and message board owners are numbered, the CHRC censors knew that the only thing they can do now, is to grind many people through the systems as possible, before their house of cards comes crashing down. But they have a big problem, and that problems name is Marc Lemire! Because of his nine year legal battle with the CHRC, and the fact that all human rights cases have been stopped pending a final determination in his case, the CHRC can't pull out its Coup de grace, and issue lifetime speech bans on all those waiting. Not only do they demand that a lifetime free speech ban be applied on Marc Lemire, but they don't even have the decency to wait for the Federal Court of Appeals to rule whether Section 13 is even constitutional. The CHRC has refused to agree to a stay of an earlier decision of the Federal Court – which is currently under appeal to the Federal Court of Appeals. As crazy as that sounds, the CHRC is pushing for the punishment against Lemire even before the Federal Court of Appeals can even examine the case. Because of the CHRC’s refusal; this now opens up a costly two-front battle that Lemire has to face. While before the Federal Court of Appeals, he also has to fight a case before the Canadian Human Rights Tribunal simultaneously. As an early Christmas present to the censors, Marc Lemire has filed a 240 page motion to the Federal Court of Appeals requesting a stay of the earlier Federal Court ruling so that the CHRC cannot issue a lifetime speech ban against Lemire. Here is a copy of the motion filed with the Federal Court of Appeals on December 11th, 2012, written by Marc Lemire’s courageous and brilliant lawyer – Barbara Kulaszka. a. issue a declaration that the publication of the article "AIDS Secrets"
hearing against the respondent Marc Lemire. (i) Mr. Justice Mosley erred in failing to respect and defer to Parliament’s repeal of s. 13 and s. 54(1) and (1.1) in Bill C-304, which passed the House of Commons on June 6, 2012 to protect freedom of expression. 5. 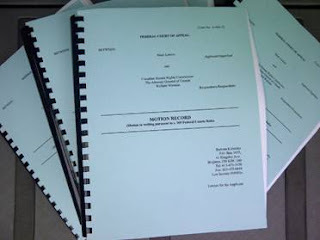 The article which the Tribunal found contravened section 13 was voluntarily removed from the Freedomsite by the applicant on April 9, 2004, some two weeks after he received notice of the complaint from the Commission. 6. Only 8 persons from Canada viewed the article, a number which would include the applicant, the complainant Richard Warman and the investigators at the respondent Canadian Human Rights Commission. 7. The Canadian Human Rights Tribunal has adjourned two pending cases before it under section 13 on a sine die basis, until final determination of this case. 8 I have reviewed the submissions of the parties and have concluded that it would be appropriate and would properly serve the interests of justice if this matter was adjourned. While the Supreme Court of Canada has ruled in Canada (Human Rights Commission) v. Taylor, 1990 3 S.C.R. 892 that s. 13 (1) of the CHRA is constitutional, the application now before the Federal Court seeks to bring clarity to this issue in view of the distinct factual and legal context giving rise to this Tribunal's decision in Warman v. Lemire. Clearly Member Hadjis' decision goes beyond the consideration alone of the penalty provisions in s. 54 of the CHRA, as he chose not to "read out" the penalty provisions and preserve s. 13 of the CHRA. It is now up to the Federal Court to determine the operability of s. 13 of the CHRA. This will achieve the clarity that the Commission has indicated and that I agree is desirable in order to allow the Tribunal to be able to determine this and other cases brought under s. 13 of the CHRA. 9 For these reasons I hereby adjourn these proceedings sine die pending the final outcome in the Warman v. Lemire case. 9. A similar ruling was made in Abrams v. Topham,  C.H.R.D. No. 14. (b) where for any other reason it is in the interest of justice that the proceedings be stayed. 11. In RJR-MacDonald Inc. v. Canada (Attorney General),  1 S.C.R. 311, the Supreme Court of Canada set out a three-part test for determining whether a stay should be granted: (1) Whether there is a serious question to be tried; (2) Whether the applicant would suffer irreparable harm if the relief is not granted; and (3) Whether the balance of convenience is in favour of granting the stay. 12. It is submitted that the case raises a serious issue to be tried, namely, the constitutionality of section 13 and ss. 54(1)(a) and (b) of the Canadian Human Rights Act. 13. The Notice of Appeal raises serious issues with respect to the effect on freedom of speech of section 13, including whether the doctrine of severance was correctly applied by Mr. Justice Mosley and whether section 13 is still a justifiable limitation on Charter rights to free speech under s. 2(b) given its legislative extension in 2001 to the Internet and other computer mediated networks. 14. If the matter is remitted back to the Tribunal, it can no longer issue a penalty order as the provisions authorizing such an order have been declared unconstitutional by the Federal Court. However, it can issue a cease and desist order against the applicant which is in effect for his lifetime and is a direct violation of his freedom of speech. The order, once made, would remain in effect notwithstanding any subsequent finding in this case that section 13 is unconstitutional. 15. No damages can compensate the applicant for the loss of his right to free speech under such a cease and desist order. 16. The article “AIDS Secrets” was voluntarily removed by the applicant in April of 2004 in an effort to settle the complaint, some two weeks after he received notice of the complaint. His remedial actions were ignored by the Canadian Human Rights Commission and the complainant, who instead began a search for other material with which to sustain the complaint. None of those other communications were found to be a violation of the Act. 17. The public interest is not damaged by a stay of the order of Mr. Justice Mosley since the article found to contravene section 13 is not on the applicant’s website and has not been for almost nine years. Only 8 persons from Canada looked at the article and probably all of those persons were those involved in the complaint, including the complainant, investigators from the Canadian Human Rights Commission and the applicant himself. 18. There are presently only two cases pending before the Tribunal, that of Makow and Topham, supra. Both cases have been adjourned sine die by the Tribunal pending final resolution of the Lemire case in order to obtain clarification of the law. This has been a well-founded caution since the penalty provisions of section 13 were declared unconstitutional. 19. In the meantime, the House of Commons repealed section 13 and its remedial provisions in section 54 by Bill C-304 on June 6, 2012 to protect freedom of speech. The Bill is now at second reading before the Senate. The House of Commons recognized the threat section 13 posed to the freedoms of Canadians and passed a bill to repeal the law. This factor must play an important role in determining the balance of convenience in granting a stay. (b) Costs of the motion.